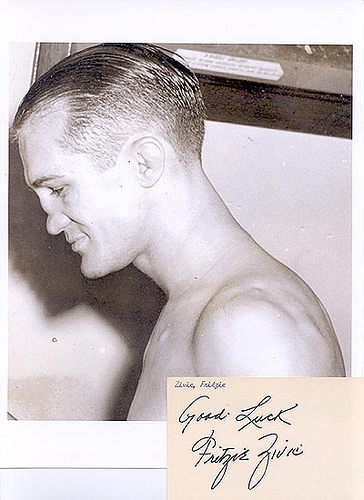 Fritzie Zivic was one of the most colorful characters in the history of boxing and with 158 wins on his record, he was also no slouch in terms of ring accomplishments. But there’s a reason why you won’t find his name on too many lists of the all-time best, despite the fact it probably deserves to be there. Zivic: He didn’t get that nose from playing piano. 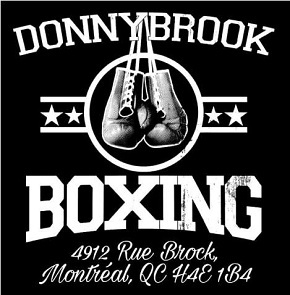 How many other boxers possess a roll-call of scalps to rival Zivic’s? Fritizie’s roster includes such names as Jake LaMotta, Sammy Angott, Lew Jenkins, Al Davis, Charley Burley, Kid Azteca, and of course Armstrong. Add in his tough battles with Sugar Ray Robinson, Lou Ambers and Billy Conn and you’ve got a warrior for the ages. Robinson himself said no one taught him more about boxing than Zivic did in their two bouts. But the fact is, aside from there being a whopping 65 losses on his record, “The Croat Comet” was one of the “dirtiest” boxers in ring history, perhaps the dirtiest, even though, as the record shows, he was never disqualified. As a result, his reputation suffered. Everyone understood what Zivic was about. Tough, canny and clever, he was a master at the dark art of errant elbows and well-timed head butts, discreet low blows and painful thumbs to the eyes. Zivic didn’t try to deny it either. As far as he was concerned, this amounted to standard procedure. 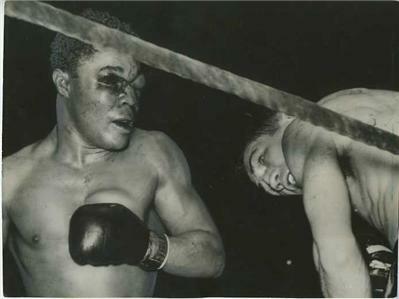 Pugilism was a rough business and when it came to foul tactics, boxers had to be ready to both take it and dish it out. 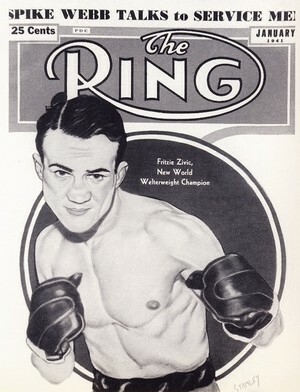 Zivic’s career began in 1931 and by 1940 he had yet to earn a title shot, his inconsistency preventing the public from viewing him as a legitimate threat. 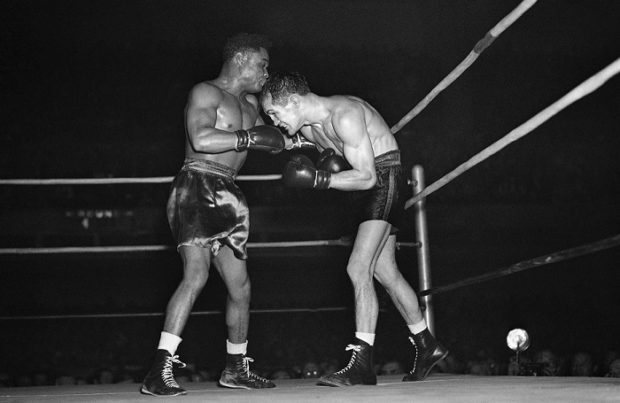 But a big win over Sammy Angott set him up nicely for a chance at Armstrong’s welterweight crown in Madison Square Garden. And Zivic began dreaming about that big, new Cadillac he always wanted. 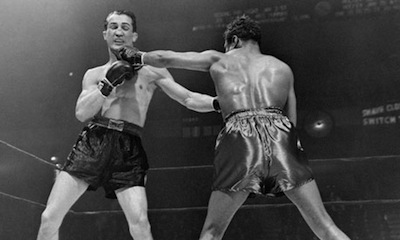 A triple division champion with 18 straight defenses of his welterweight title to his credit, Henry Armstrong was regarded as an all-time great and a lock to win. 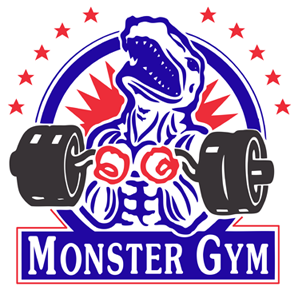 But that didn’t stop the longshot underdog from going down to the Cadillac dealership the day of the fight to give himself some extra motivation. But the first several rounds of the match were not good for the challenger. The aggressive Armstrong looked as strong and capable as ever and seemed to be cruising to a record nineteenth successful title defense. Zivic, his reputation preceding him, sought to be extra careful about any unseemly tactics and appeared inhibited. Armstrong gets home a jab. 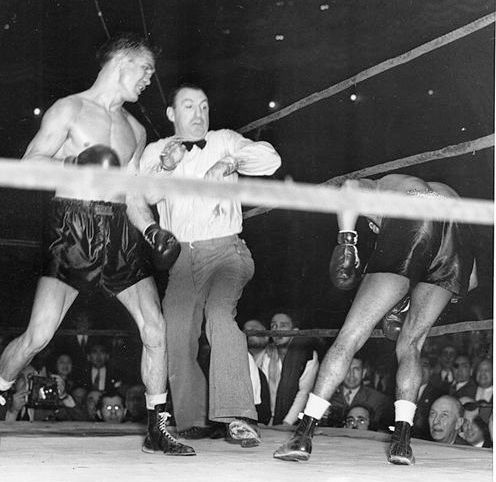 Zivic in fact was pacing himself, as he had never gone 15 rounds and knew he had to have something extra for the late going; stopping the tough Armstrong inside the distance was simply not a realistic prospect. So entering the middle rounds, the challenger began to pick it up. He used hard uppercuts to perfection, nailing Armstrong repeatedly. And then, according to Zivic, he got the big break he needed. Armstrong suffered injuries to both eyes. Trainer Ray Arcel works on Armstrong’s wounds. The bout turned into a bloody alley war. And while Zivic’s uppercuts were his prime weapon, his thumbs and laces to the champion’s eyes also took their toll. 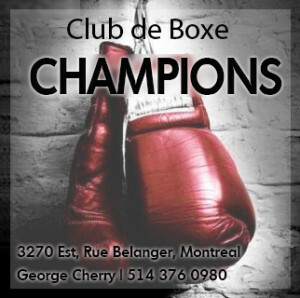 By round ten the champion bled from cuts around both eyes and it was clear that, barring a miracle, a massive upset win for the challenger was about to happen. Round 15: Zivic showed no mercy. 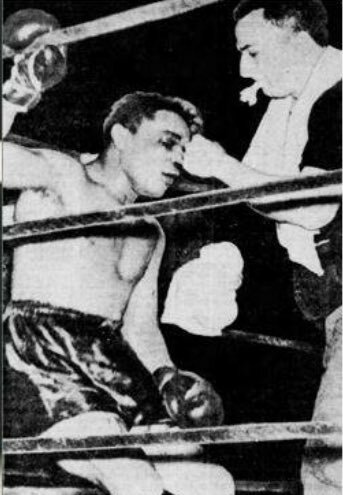 In the final round, Zivic closed the show, battering a hurt and exhausted Armstrong mercilessly. And with seconds left in the fight, he put “Homicide Hank” on the deck. We’ll never know if Henry could have beaten the count; the final bell rang before he had a chance. And while Zivic took a unanimous decision, in fact those applauding at fight’s end were paying tribute to Armstrong’s courage. “He’s the gamest guy I ever saw,” said the new champion. 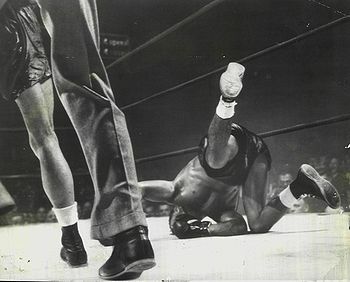 Armstrong on the canvas at the end of the fight.